The Chinese Acrobats Pigeon Forge is one of the best shows we have ever seen. If you have only one night to see one show in the Smokies, then this is one of your best choices. 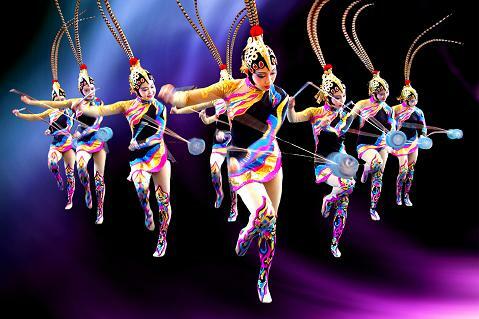 The Cirque de Chine is an excellent choice for an evening entertainment at the Smoky Mountain Palace Theater. You will have the opportunity to enjoy a world class performance by some of the world's top acrobats and gymnasts. This is a Vegas style show at about half of the Vegas price. This artistic presentation is a two hour show with dramatic and outstanding music. The focal point of the show features the fabulous Chinese Acrobats Pigeon Forge. You have to see to believe these incredible stunts, and stunts performed in a very elegant and effortless manner to say the very least. The extravagant costuming and absolute unbelievable feats of skill, athletic ability, balance and grace are truly amazing to see. When you arrive at Chinese Acrobats Pigeon Forge, your E-Ticket reservation vouchers will be exchanged for your selected theater show, attraction or lodging preference. It’s similar to how the major airlines handle online ticketing. The benefit of using E-Ticket reservation vouchers is that you can always reprint them from this website if they are misplaced by a simple login to your account - click on orders - and reprint.